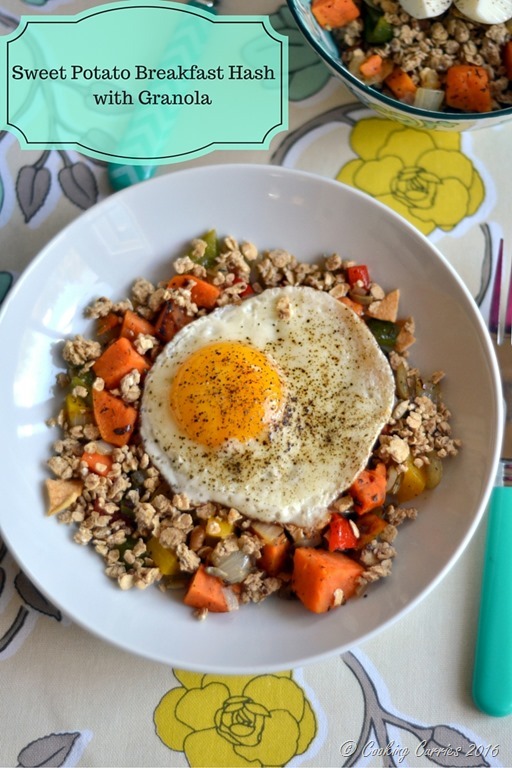 A nutritious breakfast that every morning needs – Sweet Potato Breakfast Hash with Granola, using Quaker® Real Medleys SuperGrains Cinnamon Apple Walnut Granola and topped with an egg. Lately, most of our breakfasts have been on the sweet side. It’s usually a pancake or a waffle or a French toast or peanut butter and Nutella on toast or some form of breakfast smoothie or cereal, on those really lazy days. It wasn’t anything intentional. It just happened that way. So, I am very consciously trying to make sure I include savory breakfast items to our menu, so we don’t go back to the all sweet breakfast routine again! Not that I didn’t love it, but I personally thought it was getting a little too much and was afraid that the kiddo will get used to it and expect that from now on! Whenever I make savory breakfast for weekdays, I tend towards toast and eggs (scrambled or omelet or fried eggs) or dosa (A South Indian breakfast crepe) or Upma (A South Indian savory hash / porridge with grains and vegetables). The more elaborate breakfasts are only for weekends. I really wanted to add more variety to our savory breakfast options and thought of this hash with sweet potato in it. We love sweet potato here! But just veggies wont do in breakfast right. So, I decided to add some granola to it and also top with an egg. The egg can be fried or a sliced boiled egg. I am a huge granola lover and try out pretty much all kinds that come out in the market. I am also a sucker for super food or power food. Given that, I just had to try the Quaker® Real Medleys SuperGrains line of granola and was very excited to get this opportunity. 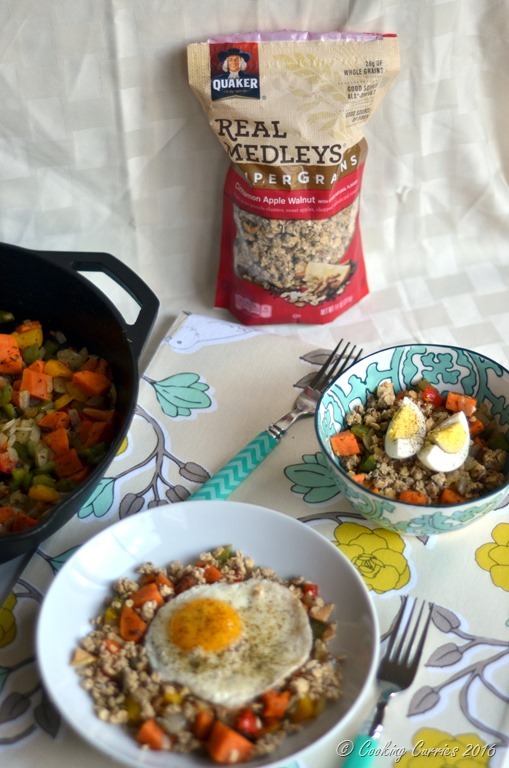 The Real Medleys SuperGrains granola includes all things good for you like Whole Grain oats, Whole Grain Wheat, Red Quinoa, Flaxseed, Sunflower Seeds, Barley and Amaranth. With all these super grains and seeds and fruits and nuts in it that provide fiber, ALA Omega-3 and whole grains, you just cant go wrong with it for breakfast to start your day right! I love it topped on yogurt or a smoothie bowl, which is usually how I eat my granola and the kiddo loved it with milk as an after school snack – he saw it and asked for it. 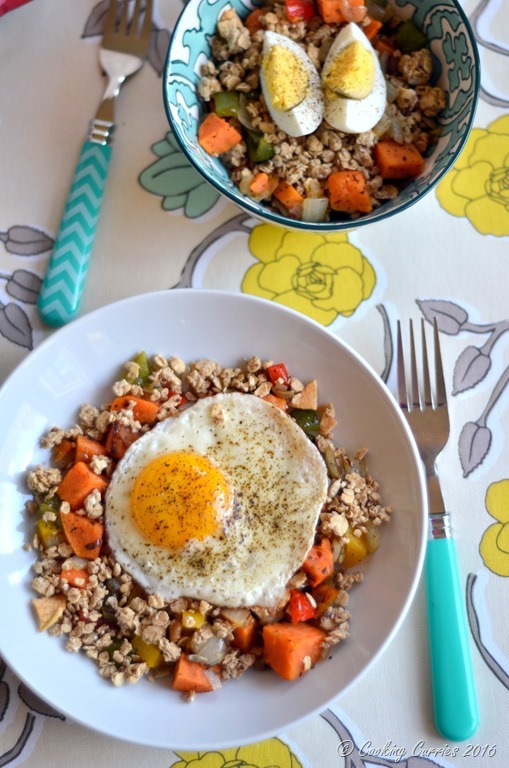 This Sweet Potato Breakfast hash with Granola is also super easy to make on a weekday morning. 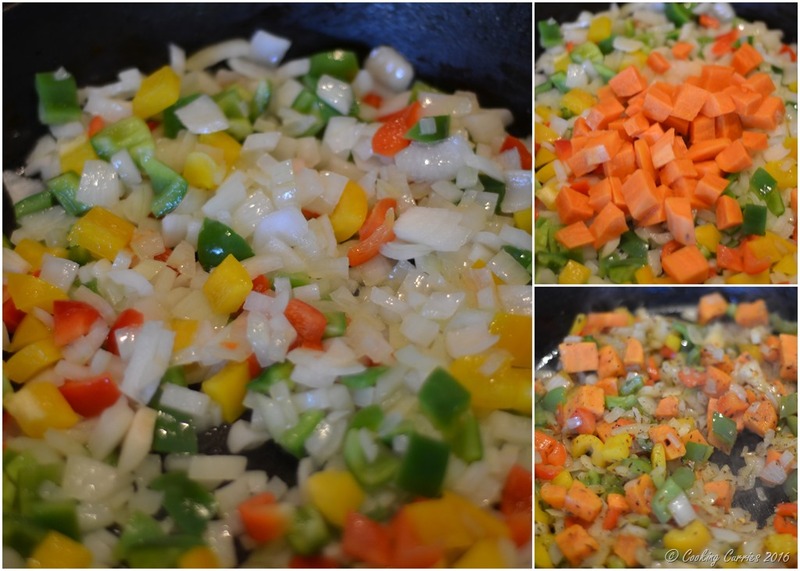 It is just a quick sauté of onions, peppers and sweet potatoes. I cooked the sweet potatoes in the microwave a little, while I was prepping the other ingredients, so it didn’t take much to cook on the stove top. Mix in the granola with the hash and top with an egg. You can even make the hash the night before, that way it takes even lesser time to get this filling breakfast ready in the morning. Cook the sweet potatoes with enough water to cover them, in a microwave for about 2 minutes to just soften them. Meanwhile, heat the oil in a skillet and add the onions and peppers to it. Add the sweet potatoes as well and add salt, pepper, herbs de provence and red chili flakes. Once the onions are lightly brown and the peppers are soft, remove from heat. In a separate skillet, heat the butter / oil. Break the eggs one at a time into the skillet and sprinkle salt and pepper over it. Take enough sweet potato hash in a serving bowl. Mix in the Quaker® Real Medleys SuperGrains Cinnamon Apple Walnut Granola. You want to wait till you serve to add the granola to keep it nice and crispy. Top with an egg and serve warm. You know you want to make this for breakfast!! 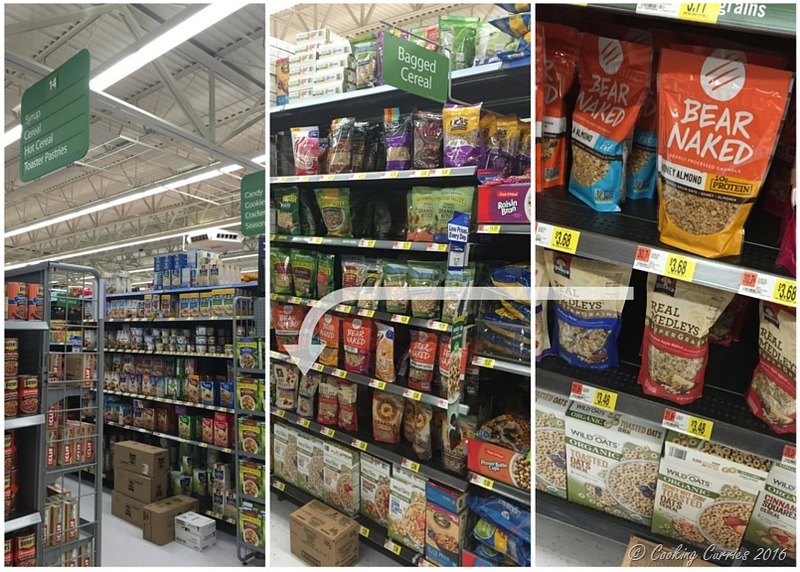 Quaker® Real Medleys SuperGrains Granola can be easily found in your neighborhood Walmart in the Cereal aisle and you can pick up the rest of the ingredients you need for the recipe, while you are there as well! I just love your pictures – They’re so pretty! Yummy! Sweet and savory, looks delicious. 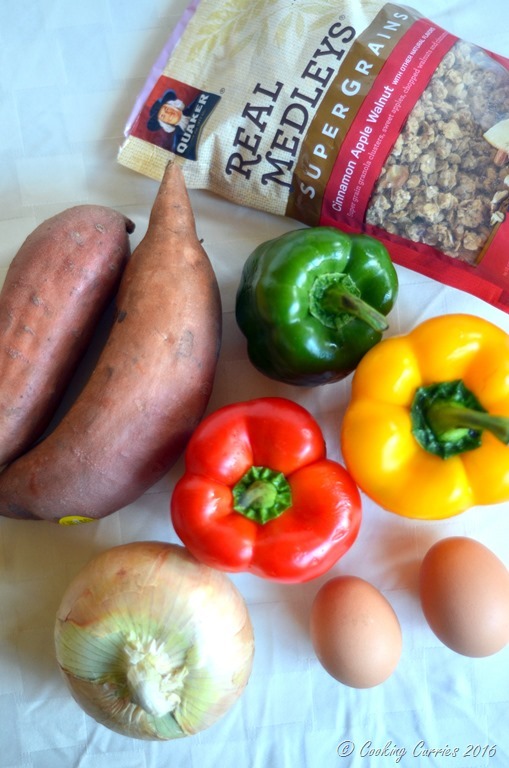 I love sweet potatoes, this hash sounds delicious, especially with a runny egg on top, yum! I love the idea of a crunchy hash! Hash and granola are a delicious combination. It is very creative. I just made something similar to this last week, yours looks soooooo good! 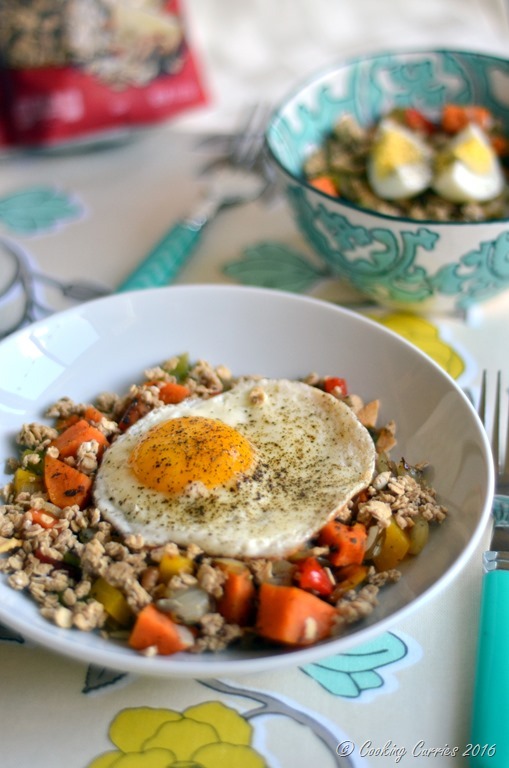 It’s a great idea to make this ahead and package up for quick weekday breakfast!